Most families of the estimated 1,400 disappeared have no information about their relatives. WHERE TO GO: The husbands of Dhana Kumari Thapa (left) and Kamala Rijal (right) were disappeared during the war. Tulsa Pandey (middle) lost her son. Kamal Prasad Tharu had been working in India, and in 2005 was on his way home for a break to meet his wife and children in Rupandehi. He never made it home. He was detained by the Army although he had no political affiliations. His wife, Dhana, made the rounds of the district police and army base. 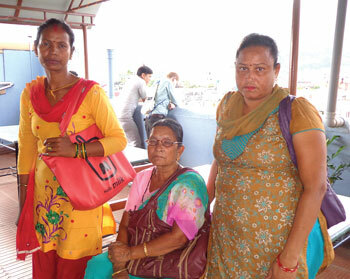 She even went to Kathmandu, carrying her baby daughter, but couldn’t find him. Relatives and villagers convinced her to conduct the last rites of her husband. It has been 11 years since Kamal Prasad’s disappearance, but Dhana still holds hope that her husband will return one day. “Until I see his body with my own eyes, I will not think of him in the past,” she says. Since her husband’s disappearance Dhana has been living in her parents’ house with her two children. Her in-laws constantly blame her for his disappearance, and this only adds salt to her wound. The 600,000 rupees that she received from the state as compensation ran out long ago, and Dhana admits it has been a struggle to raise her children without a father. “I feel that the only way to ensure such crimes are not repeated is to punish the guilty,” she says. Eight years after the conflict ended most families of the estimated 1,400 disappeared still have no information about their relatives. While some have given up, others cling on to a sliver of hope. Three days before Kamala Rijal’s husband, Gopal Rijal, was to go to Malaysia to work in 2003, he went to inquire about a missing villager at the police station. Instead, he was handed over to the Army, and was never seen again. Few hours after his capture, villagers had heard a gunshot in the nearby jungle but Gopal’s body was never found. Kamala was pressured to perform her husband’s funeral. Soon after, Kamala herself went to the Gulf to work to support her family, but didn’t like it there and returned. She spent her Rs 300,000 compensation to repay the loan she took to pay her recruiters. She regrets not educating her five-year-old son. “The government should provide livelihood training so that others like me can take care of our children,” says Kamala. Wives of the disappeared are not considered widows and are not entitled to the widows allowance. 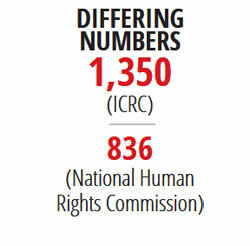 The state’s plan to provide Rs 300,000 as compensation to families of disappeared and school fees up to Rs 16,000 annually to children of the missing under 18 is stuck due to the absence of a Disappearance Commission. The CPA required the status of the disappeared be made public within 60 days. The Interim Constitution lists it as the state’s duty to search for the disappeared. Responding to 80 writ petitions filed by Advocacy Forum and other rights organisations, the Supreme Court in 2007 issued directives to the state to address the cases of enforced disappearances, to treat it as a crime, and provide compensation to the family of the disappeared. A High Level Commission of Inquiry on the Disappeared was formed but received flak for not including any family members of the disappeared, forcing the government to backtrack. War Victims Society Rupendehi’s Kedar Nath Kafle says not knowing what has happened to relatives has forced them to live in fear, suspicion and sorrow. That is usual for families, says academic Shiv Prasad Gaudel who has studied the condition of war affected. Families of the disappeared are forced to fend for themselves, suffer trauma and mental stress. "When there is motion there is friction"